Alba Health Care Sox, manufactured by Alba Health Products, are socks for diabetic people. Alba Care Socks are designed to fit loosely enough that they reduce the amount of pressure on the feet, ideal for those with sensitive feet and toes. 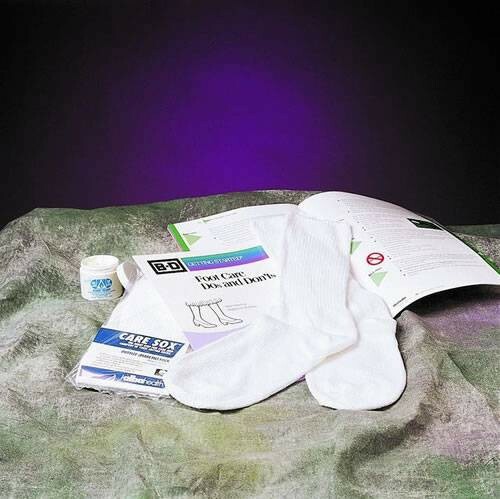 Diabetic socks are non-binding and non-constricting. These tube socks are breathable to allow circulation. The reduced friction design is perfect for those with diabetes, because it can reduce adverse health affects of tight, constricting socks. Alba Care Sox are made from a soft cotton for maximum comfort. These Discount diabetic socks are on sale now. Diabetics can develop peripheral neuropathy which can cause issues with delicate skin on the feet. Normal socks can cause circulation problems, which are avoided by wearing specific diabetic socks. With three sizes and two colors to choose from, there is a suitable sock for everyone. Vitality Medical offers a full line of Diabetes Supplies, such as Insulin Syringes, Lancing Devices and more. Do Alba Care Sox come in a crew length? We ordered the regular and my husband loves them - but would also like a "sport/crew" length for summer wear with sneakers. Thank you. Crew length socks may be available via special order. Please contact customer care at 800-397-5899 and speak with a customer service representative who will be able to help you. I ordered "caresox" for my Dad and can't remember where I got them...the name is written in blue on the heel...are these your socks?? We carry an array of socks that match both the color and style you mentioned. We recommend having a deeper look into our hospital socks to see if the one's you're looking for on our website. Like these socks, on second set. Tops seem to unravel quickly and heels seem to get holes quicker than expected. Overall I am pleased with them for the price. One-half the cost of the local health supply store. I have these socks on now! They are warm, soft, not binding in the least. I ordered one pair for a tryout and they really are just what I need. Thanks Vitality Medical for your excellent products, prices, and service. I appreciate it. Quality and comfort were both good. I have always been pleased with my purchases from Vitality, the socks were no exception. They are comfortable and the quality was good for the price I paid. I ordered these socks for my diabetic husband & they are great. I had ordered them before from another site but had to wait much longer to get them. Even after repeated washings they don't get yellowed or grey. Vitality Medical has great service. I am so lucky to have Alba Care Sox as these give me a great feeling of comfort. These are too soft and itching free.